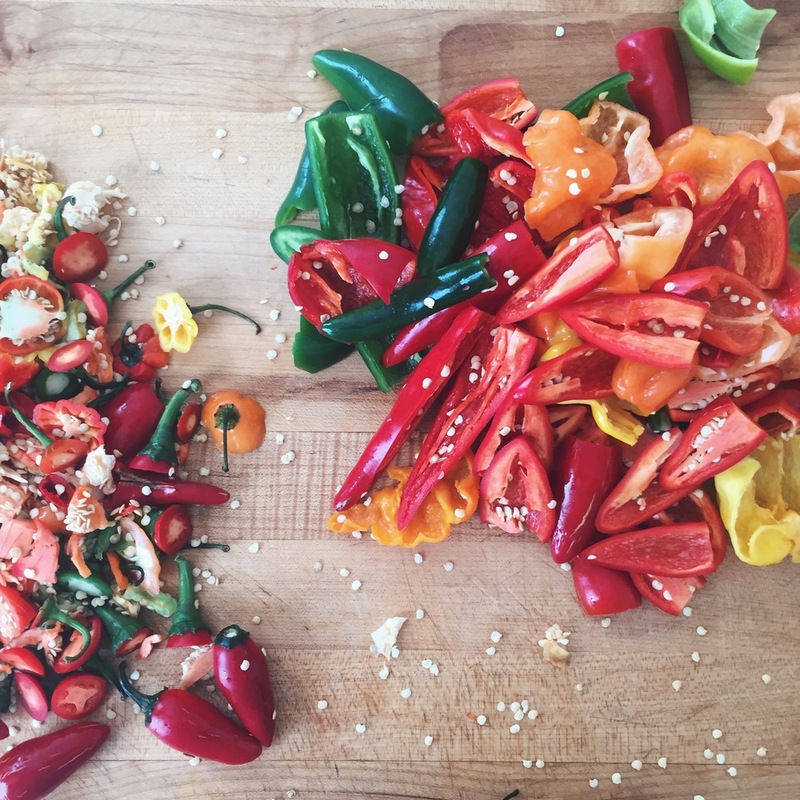 Liz's "ferment" is a homemade hot sauce that's better than sriracha! When I visited Liz and Nathan this summer, I envied their yard full of chickens and ducks, their huge tomato patch, and the greens so plentiful Liz sells them to local restaurants. But what really impressed me was their fermentation fridge, packed with pickles, sauces and preserves. Liz pulled out a gallon jar of "ferment," her homemade chili-garlic sauce, to taste while we snacked on salmon collar that Nathan had smoked (a prelude to an incredible home made dinner). The hot sauce was one of the best things I've ever tasted! Even though it was so hot it made me cry, I wanted more and more. I can't duplicate that lifestyle here in New York (I try, with my backyard hens and community garden patch), but I can make the hot sauce. I prepare mine a little milder: you can make it to your taste by removing as much or as little as you like of the seeds and pith. I like to use mostly red jalapeños for their bright color and fruity taste, with a few green ones, habeñeros, serranos, or Korean peppers thrown in to add complexity. Use whatever you can find. If you have a CSA that overloads you with hot peppers, this is a great way to use them up! Liz makes hers by the gallon using 5 pounds of peppers, but let's start with a pint. Making hot sauce with locally grown peppers: jalapeños, habeñeros, and Korean chiles. 1. Start by setting some plain yogurt (about 1/2 cup) over a strainer to drain out the whey. You'll just need a teaspoon of the whey to help start the fermentation. 2. Rinse the peppers thoroughly. Put on some gloves, and be careful to keep your hands away from your face! Trim the stems off the peppers, and cut them in half. If you want a mild condiment, remove nearly all the seeds and pith. If you want it wildly hot, leave them all. I keep the pith and seeds from about 1/3 of the peppers. 3. Decide how much garlic you want, the more the stinkier! Peel it and trim the ends. 4. Place the peppers, garlic, 1 teaspoon salt, and whey in a food processor. Blend until you have a paste. If you need too, add a little water, the peppers bits should be just barely submerged in their own liquid if you press them down. 5. You'll need a glass jar big enough to allow a few inches of headroom above the hot sauce, so it doesn't bubble over. Wash the jar, and sterilize it with boiling water or white vinegar (rinse off the vinegar, if using). 6. Transfer the hot sauce to the jar, and pack it down to get as much air out as you can. Make sure the sides of the jar a clean. sprinkle a little more salt on top of the hot sauce to prevent mold. Cover the jar with a bit of cloth or paper towel, and secure it with a rubber band. 7. Leave the jar in a dark place in your kitchen, It should start bubbling up in a few days to a week. Stir it, and let it bubble up one more time before sealing the jar and transferring it to the fridge. (Liz says, if a little mold forms during fermentation, just scrape it off.) This will keep indefinitely.